Harriet was given a piece of paper by a white abolitionist neighbor with two names, and told how to find the first house on her path to freedom. At the first house she was put into a wagon, covered with a sack, and driven to her next destination. and kind enough to give her directions to safe houses and names of people who would help her cross the Mason-Dixon line. She then hitched a ride with a woman and her husband who were passing by. They were abolitionists and took her to Philadelphia. Here, Harriet got a job where she saved her pay to help free slaves. She also met William Still. Still was one of the Underground Railroad's busiest "station masters." It is said that Henry "Box" Brown, a slave, had himself nailed in a wooden box and mailed by real train from Richmond to William Still in Philadelphia.] He was a freeborn black Pennsylvanian who could read and write. He used these talents to interview runaway slaves and record their names and stories in a book. He hoped that in the future, family's could trace their relations using this book. Still published the book in 1872 under the title The Underground Railroad where describes many of Tubman's efforts. It is still published today. With the assistance of Still, and other members of the Philadelphia Anti-Slavery Society, she learned about the workings of the Underground Railroad (click for details). In 1850, Harriet helped her first slaves escape to the North. She sent a message to her sister's oldest son that said for her sister and family to board a fishing boat in Cambridge. This boat would sail up the Chesapeake Bay where they would meet Harriet in Bodkin's Point. When they got to Bodkin's Point, Harriet guided them from safehouse to safehouse in Pennsylvania (which was a free state) until they reached Philadelphia. In 1849, Tubman became ill again, and her value as a slave was diminished as a result. Edward Brodess tried to sell her, but could not find a buyer. Angry at this effort (and the unjust hold he kept on her relatives), Tubman began to pray for her owner, asking God to make him change his ways. "I prayed all night long for my master," she said later, "till the first of March; and all the time he was bringing people to look at me, and trying to sell me." When it appeared as though the sale was being finalized, she switched tactics. "I changed my prayer," she said. "First of March I began to pray, 'Oh Lord, if you ain't never going to change that man's heart, kill him, Lord, and take him out of the way." A week later, Brodess died, and Tubman expressed regret for her earlier sentiments. Ironically, Brodess's death increased the likelihood that Tubman would be sold and the family would be broken apart. His widow Eliza began working to sell the family's slaves. Tubman refused to wait for the Brodess family to decide her fate, despite her husband's efforts to dissuade her. "[T]here was one of two things I had a right to," she explained later, "liberty or death; if I could not have one, I would have the other." Tubman and her brothers Ben and Henry escaped from slavery on September 17, 1849. Tubman had been hired out to Dr. Anthony Thompson, who owned a very large plantation called Poplar Neck in neighboring Caroline County, and it is likely her brothers labored for Thompson there as well. Because the slaves were hired out to another household, Eliza Brodess probably did not recognize their absence as an escape attempt for some time. 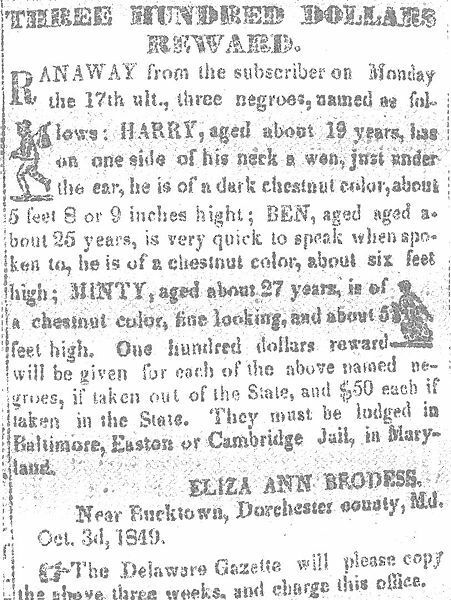 Two weeks later, however, she posted a runaway notice in the Cambridge Democrat, offering a reward of up to one hundred dollars for each slave returned. Once they had left, however, Tubman's brothers succumbed to second thoughts. Ben had just become a father, and the two men – fearful of the dangers ahead – went back, forcing Tubman to return with them. Soon afterwards, Tubman escaped again, this time without her brothers. The night before she left, Tubman tried to send word to her mother of her departure. She located Mary, a trusted fellow slave, and sang a coded song of farewell: "I'll meet you in the morning," she intoned, "I'm bound for the promised land". While her exact route is unknown, Tubman made use of the extensive network known as the Underground Railroad. This informal but well-organized system was composed of free and enslaved blacks, white abolitionists, and other activists. Most prominent among the latter in Maryland at the time were members of the Religious Society of Friends, often called Quakers. The Preston area near Poplar Neck in Caroline County, Maryland contained a significant Quaker community, and was probably an important first stop during Tubman's escape, if not the starting point. From there, she probably took a common route for fleeing slaves: northeast along the Choptank River, through Delaware and then north into Pennsylvania. A journey of nearly ninety miles (145 kilometers), traveling by foot would take between five days and three weeks. Her dangerous journey required Tubman to travel by night (guided by the North Star), avoiding the careful eyes of "slavecatchers", eager to collect rewards for fugitive slaves. The "conductors" in the Underground Railroad used a variety of deceptions to hide and protect her. At one of the earliest stops, the lady of the house ordered Tubman to sweep the yard to make it appear as though she worked for the family. When night fell, the family hid her in a cart and took her to the next friendly house. Given her familiarity with the woods and marshes of the region, it is likely that Tubman hid in these locales during the day. Because the routes she followed were used by other fugitive slaves, Tubman did not speak about them until later in her life. Particulars of her first journey remain shrouded in secrecy. She crossed into Pennsylvania with a feeling of relief and awe, and recalled the experience years later: "When I found I had crossed that line, I looked at my hands to see if I was the same person. There was such a glory over everything; the sun came like gold through the trees, and over the fields, and I felt like I was in Heaven." In 1849, worried that she and the other slaves on the plantation were going to be sold, Tubman decided to run away. Her husband refused to go with her, so she set out with her two brothers, and followed the North Star in the sky to guide her north to freedom. Her brothers became frightened and turned back, but she continued on and reached Philadelphia. There she found work as a household servant and saved her money so she could return to help others escape.